The new generation of cordless battery powered lawnmowers combine the advantages of their clean, lightweight electric corded cousins and their powerful versatile petrol powered cousins without the disadvantages of each; making them the lawnmower of choice for your average home garden. Here is a table of the current most popular cordless battery powered lawnmowers currently being sold on Amazon in the UK. Scroll down for our Editors Pick of the top ten cordless battery powered lawnmowers or click here to see our Cordless Battery Powered Lawnmower Buyers Guide. Here are our own 10 favourite cordless battery powered lawnmowers for 2018, with detailed descriptions for each one below the table. 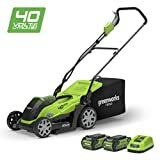 Despite it’s rather strange name, this is a fantastic general purpose cordless battery powered lawnmower which will perform fantastically well for most home gardens. This Bosch mower is powered by a 36V lithium ion battery coupled with the new Power drive 43Li + system delivers consistently high torque in all conditions. Weighing only 14 Kg this is very easy to push and the back combs will help to leave the nice striped effect on your lawn – granted the stripes won’t be as pronounced as those made by heavier petrol lawnmowers – but the lightness, and easy of use surely make up for lighter stripes! It is also has an AGR certificate which means it has specially been designed to put less strain on your back. 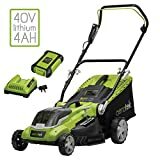 This cordless battery powered lawnmower from Bosch is designed for larger lawns hence it comes complete with 2 lithium ion batteries each of which should give a good half hour of cutting time and only take an hour to recharge. What stood out to us when reviewing this lawnmower was the stripe effect that it gives – even though it only weighs about 14 Kg – making it better for your back – the rear roller does give that lovely striped finish to your lawn. Mountfield have taken their expertise in petrol lawnmowers and applied this to the new generation of cordless battery powered lawnmowers. 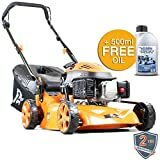 This quality self propelled cordless lawnmower with its powerful 80V battery, steel chasis and rear roller will easily tackle larger lawns with the assurance of a petrol mower minus the smell and noise! Almost exactly the same lawnmower as above just minus the rear roller, a slightly higher lowest cut level (27mm vs 20mm) and marginally more noise and vibration hence the lower price; although it does have a larger grass bag (60l vs 55l). 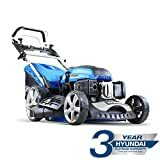 This quality self propelled cordless lawnmower with its powerful 80V battery which easily tackle larger lawns with the assurance of a petrol mower minus the smell and noise! Keep in mind that the steel chasis whilst making this mower stronger than its plastic cousins it also makes it significantly heavier at about 30Kg. This cordless battery powered lawnmower from Flymo is a “lightweight” machine suitable for smaller lawns – it works best if the grass is dry. It can be adjusted to cut at 5 different heights with a simple lever. 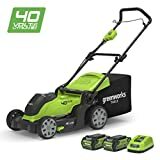 Featuring a 32cm cutting width and weighing just 9.5Kg this cordless battery powered lawnmower from Yard Force is ideal for mowing smaller lawns. 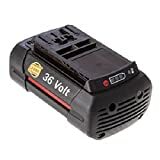 It includes a 40V Samsung Lithium-Ion 2.5Ah battery with quick charger and can easily be adjusted to cut at five different heights. Although it does come with a rear roller, due to the extremely light nature of this machine the roller is unlikely to leave a recognisable stripe on your lawn. A great mid range cordless battery powered lawnmower from the up and coming Greenworks. This model comes with an extra lithium ion battery so if you start with both fully charged you should get a good hours mowing. It folds down for easy storage and weighs just under 21Kg. 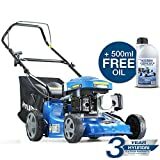 This mower comes with a free mulching plug and the mulcher is really good for fertilising your lawn with the clippings. 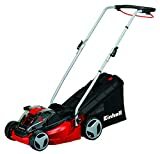 A fantastic cordless battery powered lawnmower at a very reasonable price. We really like this mower because it is incredibly easy to set up and use. It has side combs next to the front wheels which enable a close cut to the edge of your lawn. 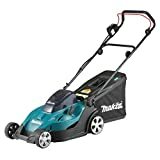 This is a robust yet lightweight mower and the absence of a rear roller make it ideal for mowing messy looking bumpy lawns turning them into neatly mowed lawns! A quality machine from Black + Decker – this cordless battery powered lawnmower comes with two fast charging lithium ion batteries making it perfect for mowing all but the largest gardens. 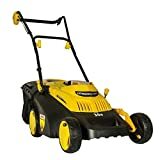 It features six cutting heights easily adjusted with one lever and a neat battery charge indicator, although you will usually feel when you need to replace the battery as the mower as the lawnmower will start to struggle. The large back wheels make mowing bumpy ground much easier too. Another quality cordless battery powered lawnmower from Mountfield. This is less powerful than the other 80v Mountfiled mowers we listed above hence the lower price. This lawnmower features a rear roller and since it weighs about 16Kg you should get a decent stripe on your lawn. A good buy from Mountfield and it comes with a 24 month guarantee. This expertly written buyers guide will ensure that you are fully informed when it comes to choosing the best battery powered lawnmower to suit your type of garden and your particular requirements. The answer is usually ‘not tall enough’, but don’t take this for an answer when it comes to an expensive piece of gardening kit! Gardening is a joy, spending hours using a tool that is uncomfortable or makes you feel miserable is not the way to live! Look at the range of settings available on the handles of the cordless lawnmowers. Check to see if the handle can change angle as well as its height. If you have the opportunity, try out a cordless lawnmower. Most cordless mowers are relatively lightweight although they do range in weight from under 10Kg to over 30Kg so consider how heavy it is and how strong you are before making your choice. While it might be great to find a new workout routine, will you shun mowing because it is too much like hard work? Just because you have found the mower that ticks all of the boxes for your garden, it doesn’t make it the perfect electric lawnmower for you. This purchase needs to be both the right battery powered lawnmower for your garden and for you! A few top tips if you are looking to buy a cordless lawnmower online. If you see a very low price, check for things such as manufacturers guarantees and reviews on the specific product. Double and triple check if it comes with a battery and charger. Lower prices often mean that a battery isn’t included or only one battery instead of two. Can I easily find spare parts – particularly new batteries – all lithium ion batteries eventually will need replacing – the better ones may last as long as the mower does! Check the ergonomic design – some battery lawnmower are actually have an AGR certificate which means it has specially been designed to put less strain on your back. Ask in our forums if you are looking for a cordless lawnmower that does not feature in our editors picks; someone is sure to own or have used one! What is your lawn used for? Is it as smooth as a bowling green and the centre piece of your garden or is it used as a sports pitch by your children (and you!)? Think about the wear and tear that mowing your lawn will inflict on your cordless lawnmower. Lightweight and plastic, or heavy duty with a metal chasis? While the appearance of your mower might not be your style choice, you need to pick one that will cope with your garden. Remember that lawnmowers with a rear roller are designed to give that beautiful striped finish but will not work on bumpy ground, so if you have a bumpy lawn stick with a four wheeled lawnmower. A useful extra that many cordless lawnmowers are now starting to incorporate is a mulch setting, whereby the grass clippings are finely ground and spread on your lawn as a nitrogen rich fertilising mulch! 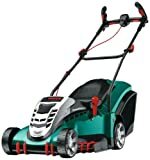 How much do good cordless lawnmowers cost? How long is a piece of string? Battery powered gardening tools are one of the items of gardening kit (more than most, I would argue) that really live up to the adage of ‘you get what you pay for’. This doesn’t mean, however, that you have to re-mortgage and buy the most expensive battery powered lawnmower that you can find. What it means in practice is: don’t skimp! Research common parts that need replacing and find out how much they cost. If you’ve ever bought a printer, you’ll know that sometimes the cheapest initial spend can quite often turn into the most expensive option in the long run. We hope that our shortlist of 10 Best Cordless Battery Powered Lawnmowers 2018 has been of use to you. It’s never an easy task to pick the perfect battery lawnmower for your garden but with a few top tips we hope we have made the journey a little easier for you. Looking for something more traditional or maybe you are a petrol head 🙂 ? Why not take a look at our best petrol lawn mower reviews?